On June 21, the SF Planning Commission DENIED a proposal for a conditional use permit to open a Los Angeles-based Healthy Spot chain store in the former Radio Shack location on 24th Street after hearing opposition from local pet stores, concerned citizens Upper Noe Neighbors and FUNDOG. Read about it in Hoodline. Formula retail pet store Healthy Spot from the L.A. area has chosen the former Radio Shack location on 24th Street to launch their enterprise in San Francisco. Local pet store merchants decry the unfair marketing tactics of this company and the potential for devastation to established small businesses. Read more and sign the petition here. October 19, 2017 - GGNRA Battle Won !!! January 4, 2017 - Legal Defense Fund: Stop the GGNRA Dog Rule launched the WoofieLeaks website to publish documents received from the National Park Service as part of the Freedom of Information Act lawsuit against the National Park Service. The public has a right to know what was going on behind the scenes while the Park Service was supposed to be listening to and incorporating community input on its proposed dog restrictions for the GGNRA. Documents obtained reveal that the agency was biased. Federal employees were hostile toward anyone who opposed its plan—from concerned community members to elected officials. Read the actual emails at WoofieLeaks.com. We stand behind these leaders who have consistently worked to keep local parks open to San Francisco families who recreate with their dogs. They have always had our backs and it is time to have theirs. As a San Francisco City & County Supervisor, Scott Wiener recognized early on the problems with the National Park Service’s proposed GGNRA Dog Management Plan. His support went way beyond a supportive letter or call. He convened hearings, passed San Francisco resolutions; met personally with GGNRA staff, seeing ways through the political impasse, and joined us – front and center – on our marches and rallies. In addition to this, he secured funding for additional staff and facilities for San Francisco’s Animal Care & Control. Joel has been clear in his actions and his words that he supports recreation for dogs in our parks and open space, including preservation of the off-leash opportunities that exist today in the GGNRA. His columns in the Examiner have been instrumental in raising awareness about the need for canine recreation in our crowded city. Joel is a no-nonsense socially liberal fiscally conservative leader who promotes sensible solutions to San Francisco's issues. Don't be confused. You might have read about a guy named Bruce who has a Progressive slate bias and a one-man political action committee. You can read the recent CW Nevius article about it where I state my opinions strongly. Local dog group leadership has been unanimous in their shock and distain for these endorsements and the process (or lack of) that created them. The GGNRA has released their Draft Dog Management Plan/Supplemental Environmental Impact Statement (SEIS) which proposes severe restrictions for off leash dog walking at Fort Funston, Ocean Beach, Crissy Field and other areas within the GGNRA. Help Now To Keep Off Leash Walking Intact. If the Plan is enacted, our local parks will be severely impacted. As off-leash places like McLaren and Bernal become overcrowded, the overflow will be pushed into smaller and smaller local parks, like Upper Noe. We were starting to see this effect of beach closure during the recent federal shutdown. Keep in mind that local Rec & Park plans exist to shrink off-leash area in McLaren and Bernal too. We urge you take action by submitting a public comment to the National Parks Service. The following paragraph states our position well. Use it as a template for your own comment or see below for more suggestions and help. The SEIS does not adequately address dispersion issues. The SEIS does not adequately address the environmental and social impact of forcing large numbers of people and dogs into much smaller areas. Reducing the amount of area available for off-leash will significantly degrade the park experience for people with dogs. It will increase conflicts. Even more importantly, the SEIS does not address the environmental and social impact on small, neighborhood parks in cities like San Francisco next to the GGNRA. Because the GGNRA is located immediately adjacent to one of the most densely populated areas in the United States (San Francisco), it provides much needed recreational open space for Bay Area residents. 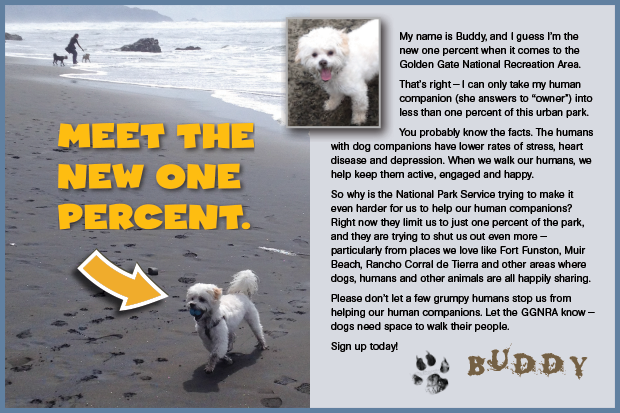 If that open space is lost to recreational access, people and their dogs will move to the much smaller city parks and they will not be able to absorb the hundreds or thousands of people with dogs each day that will be kicked out of the GGNRA. As further proof that the GGNRA did not consider impacts on city parks in San Francisco, the Preferred Alternative suggests the nearest legal off-leash area in San Francisco to Fort Funston is Lake Merced. That off-leash area has been closed to off-leash for years and has been turned into a native plant restoration area and habitat for the endangered red-legged frog among other animals. Yet this is where the SEIS suggests people with dogs go.